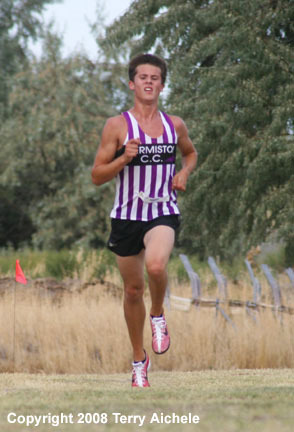 HERMISTON- Senior Jordan Ringe of Hermiston set a blistering pace to win the Hermiston Invitation Cross Country varsity boys race on Friday afternoon at Sandstone Middle School in Hermiston with a time of 16:06.3. 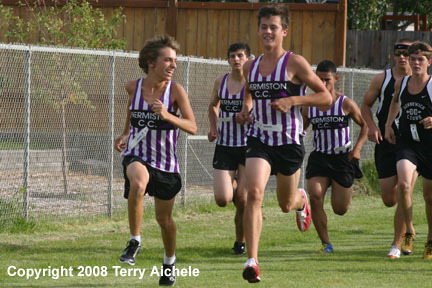 Samuel Wick, a junior from Hermiston, came in second with a time of 16:57.8. Third place went to Peter Gilbert from Pasco, 4. Ty Schoenwald from Kennewick, 5. Jose Marcial from Kiona Benton, 6. Colton Winkler from LaGrande, 7. Antonio Ortiz from Hermiston, 8. Andrew Valdez from Hermiston, 9. Jonathan Larson from Hermiston and 10. Garrett Brimm from Kennewick. LEFT - Jordan Ringe, second from left, smiles as a teammate talks to him early in the race on Friday afternoon. 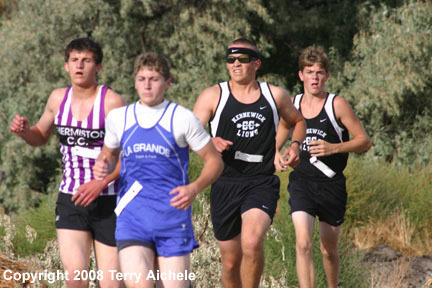 RIGHT - Far left, Samuel Wick who will come in second place, is in the middle of a pack of runner during the first circuit of the cross country course at Sandstone Middle School. 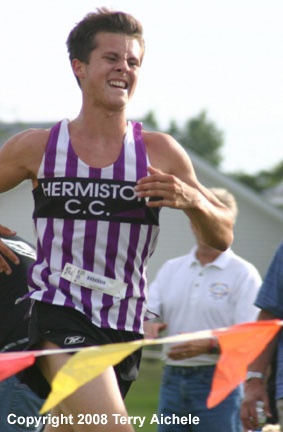 LEFT - A Hermiston runner makes his way down the hill after making a circuit of the Field of Dreams. 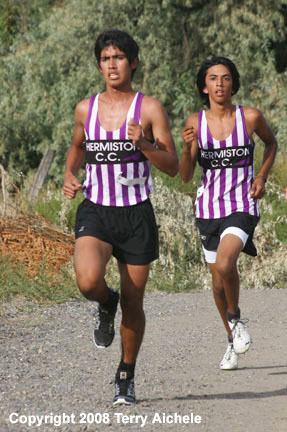 RIGHT - Two Hermiston runners make their way down the hill from the Field of Dreams baseball complex during the cross country race that took place Friday at Sandstone School. LEFT - A group of runners including Peter Stice from Umatilla, fourth from left, run down the hill after making the circuit of the Field of Dreams. 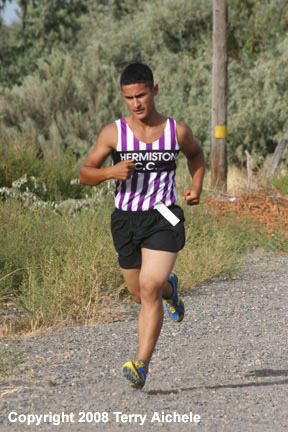 RIGHT - Hermiston senior Jordan Ringe nears the grove of trees on the Sandstone cross country circuit. 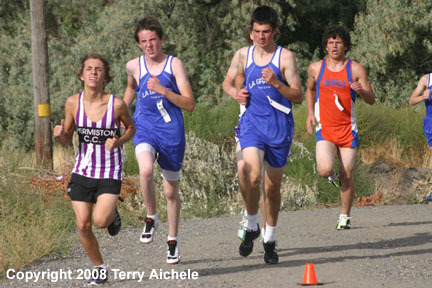 He ended winning by nearly 50 seconds over teammate Samuel Wick. Jordan Ringe crosses the finish line with a time of 16:06.3. It would be almost minute before the second place runner would arrive at the finish line.